Millions of rooftops now contain solar panels and the majority of the solar cells that make up those panels today are made from silicon. Silicon solar cells require expensive, multi-step processing conducted at very high temperatures in special clean room facilities. Despite these complications, the price of solar panels has continued to drop dramatically over the years. But even as the price of solar cells gets lower and lower, there are still widespread efforts to find even better ways to make them. One of those ways is with perovskite solar cells. Perovskites are materials with a characteristic crystal structure and are quite common in nature. Perovskites can be formed with a wide range of elements and can exhibit a variety of properties. They were first used to make solar cells about 10 years ago and those first cells were unimpressive in most respects. However, there has been steady progress since that time. 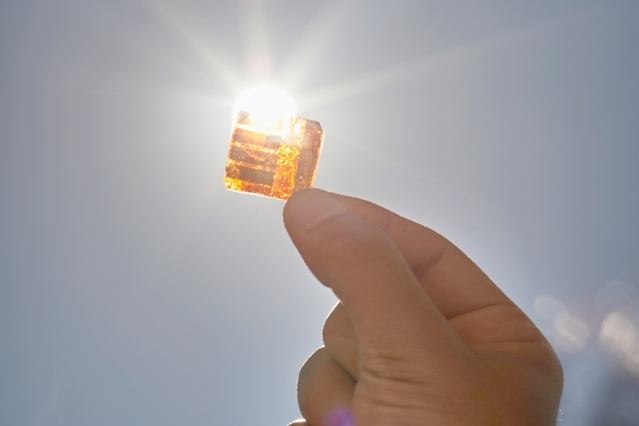 The potential advantages of perovskite solar cells are that they can be made from low-cost materials and can be manufactured using liquid chemistry, a far cheaper process than what is used to make silicon cells. Researchers at MIT and several other institutions have recently published the results of research on how to tailor the composition of perovskite solar cells to optimize their properties. What used to be a trial-and-error process can now become much more engineered and should lead to perovskite solar cells with performance that could exceed that of silicon cells. Silicon solar panels are a huge, worldwide industry and displacing them in favor of an alternative technology is a tall order. But if perovskite cells can be optimized for large-scale manufacturability, efficiency and durability, they could definitely give silicon a run for its money. Photo courtesy of Ken Richardson/MIT.